The Canon Legria Mini is ideal for taking selfies and producing home-made YouTube videos but is it a better buy than a smartphone? The Oxford English Dictionary has dubbed the word “selfie” as the word of 2013, and the Canon Legria Mini is the camcorder for those who love to see themselves on camera. 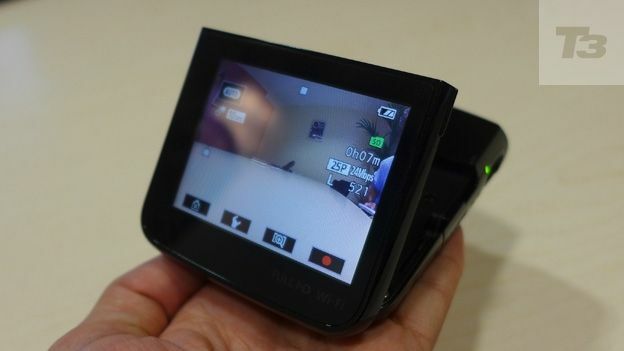 Hoping to fill the gapleft by the Flip camcorder and take on Sony's portable camcorders and the GoPro HD Hero, it's pocket-friendly, has a 170-degree wide-angle lens and a 180-degree flexible display. With video capability on top-tier smartphones like the iPhone 5s, HTC One and Samsung Galaxy S4 improving all the time, is it worth investing in a standalone recording gadget? T3 took to some self-documenting to test Canon's latest dinky camcorder. As we mentioned, the Canon Legria Mini is built to be carried around, small enough to fit in a jacket pocket or bag. Weighing just 160g and measuring 96mm thick, it's easy to hold in one hand, leaving you free to gesture as you record your selfie. Being small, it'll also fit anywhere, much like a GoPro but with the added bonus of a screen. The build is plastic but not cheap and feels sturdy and more than capable of dealing with a few bumps and scrapes. Where the Legria mini gets interesting is the flexible display and the kick-stand. With the 180- degree display you can shoot yourself from any angle and, of course, constantly check how good you look on camera. It's a handy build trick and one that's ideal for the target audience. The controls on the Mini are pretty basic but that's fine as it's essentially a point and and shoot and who wants to be fiddling with controls when there's an ironic video to be shot on the Tube. When it comes to video features, there are a few nifty additions. There's interval recording, perfect for recording your twerks, that allows you to record in five, 10, 30 second, one minute and 10 minute intervals. There's video snapshot for your hilarious "confused face" mid-video and for those who love to draw in their videos, we're looking at you My Drunk Kitchen, there are touch decorations. All are pretty simple and easy to use, they're not going to win any cinematography awards but they're fun and let you get creative with your vids. On board you'll also find Wi-Fi for swift uploading, HDMI out, USB and there is audio recording although it's not as good as a stand-alone mic and there's no port for adding and additional one so no Roots-style music videos here. There's also no headphone socket, which is a bit of a mystery, we would have liked to have one on here. Much like the GoPro, the Legria Mini's lens is wide angle up to 160 degrees in video and 170 degrees when capturing stills. For such a small camera, it's certainly a stand-out feature and allows you much more room in the shoots that you're taking. Unfortunately, there's no zoom but Canon does offer the ability to switch to a close-up angle of 71 degrees but there's no in-between. Having said that, with such a high-video recording format there's plenty of scope for that super-close up in the edit. On to the all important screen and it takes up a large part of the Legria Mini's body at 2.7 inches. It's fully touchscreen and whizzes around the menus although some are fiddly for those with bigger digits. At 230,000 dots, it's not pin sharp but quality is comparable to other pocket camcorders out there and good enough to see if you've got your bedroom teddy bear in shot and in focus. It's a Lithium Ion offering and you have the option of charging up by plugging directly into the camcorder or using the battery-pack supplied out of the box. Recording time is around one hour but this does vary if you're using the Wi-Fi to upload. Within the Legria Mini you'll find Canon's HS system, usually found in its compacts and this is the first camcorder to come with these smarts. In action, it makes for great video quality, especially when shooting in low-light conditions and that's mainly down to the 12.8CMOS sensor with DIGIC D4. The maximum video quality is 1920 x 1080, which is more than good enough for YouTube and home movies. Stills are captures at 12.8 megapixels. In the wild, the quality is better than the iPhone 5s or similar but lags behind the GoPro with its 4K capability but who needs 4K on YouTube, or for that matter anywhere, yet. The Canon Legria Mini is something of an anomaly. On the one hand, it's great to see such a imaging powerhouse coming out with something different and the Canon Legria Mini is a great idea and works in practice. It's ideal for budding YouTubers and bedroom VJs. But with the slow-march of smartphones with camcorder-matching video recording capabilities, like the iPhone 5s, Nokia Lumia 1020 and HTC One it's a struggle to see why many would add this to their tech collection.